Our Emile Henry dishes bring a delicate, natural touch to the preparation, cooking and presentation of your lasagnas, gratins, roasts. Made from HR ceramic (high resistance), they diffuse the heat evenly, ideal for controlled, natural cooking, and can go directly from the freezer to the hot oven. Our strong glaze protects your dish from scratches and chips, and it can be cleaned in the dishwasher without losing its Color. All Emile Henry products are made in France and offer a ten year guarantee. This terrine is classic French. It is an oblong, ceramic casserole dish with straight sides and a lid and is designed to cook layers of chopped meats and vegetables and to freeze desserts made of ice cream, Custards, fruits and gelatins. The tight-fitting lid allows the ingredients to steam so foods emerge tender and moist and for frozen desserts to set up perfectly. This terrine is classic French. 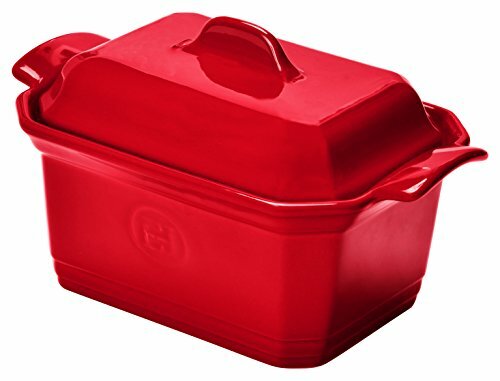 It is an oblong, ceramic casserole dish with straight sides and a lid and is designed to cook layers of chopped meats and vegetables and to freeze desserts made of ice cream, custards, fruits and gelatins. The tight-fitting lid allows the ingredients to steam so foods emerge tender and moist and for frozen desserts to set up perfectly.